Here we are having a nice day-off from the IT office, and spending business hours tackling that massive backlog of home-based tech-support requests…. Ok, spent a while on this one, and thought that I’d chuck this blog together with a record of my thoughts, so I don’t have to figure this out again. So, on review, I see that we may need to commit to the new and glorious “Photos” app on the Macbook, that came in during that major upgrade a while back. It has already consumed all the contents of the iPhoto library, so why not – I would just need to transfer in all the photos and videos that don’t exist in that Photos library yet. Will check that out next. now all the JPG and MP4 content was visible in the camera folder. Dragged it over onto the Macbook, and went into iPhoto to import the new files to the Library. Got into some conversation today about sourdough bread with some loaf enthusiasts, and was relating recent activity in the home-kitchen. Thought I would offer up a link into a recent Instagram post about the sourdough sandwich loaves that I am currently cranking out. There sure is a lot going on out there in Instagram-land about the sourdough. I’ve picked up some good connections on there from all over the place. Must be all the relentless #hashtagging! Home-bakers, and professionals all crafting their sourdough bread outcomes. Is great to be a participant in this online community! Well, every 20 years or so it’s probably time to replace a faulty wooden fence – you know the kind, the sort of fences that have been propped up by angled-support stilts, and really wobble in a heavy storm. 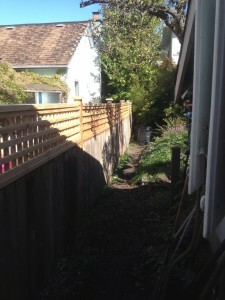 Summer 2014 is the year for our fence-replacement project, and is a backyard project that has recently been completed. The project unfolded over several weekends in August and September this summer, and we had many sunny days out in the yard to work on this one. The post-holes are all about 2′ deep, and filled with Post-Haste quick-set concrete, and some large hunks of concrete aggregate that have been laying around the yard for a while. 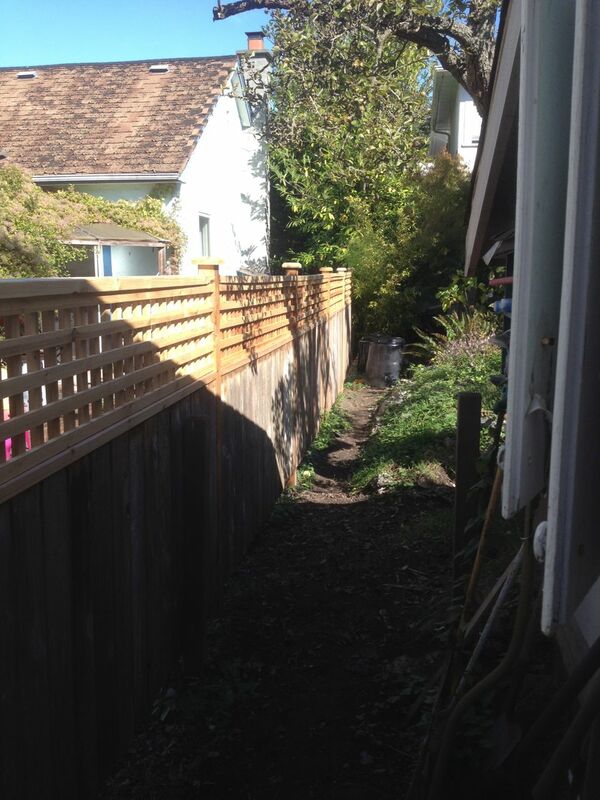 What you can see in the 2nd picture here is the design approach – 8-foot sections with 2×4 cedar beams used to hold the recycled cedar planks from the old fence. 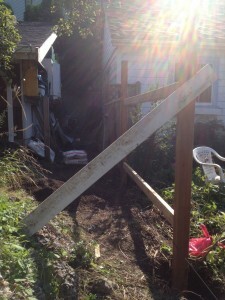 The old fence had the planks touching the ground, so we chopped the rot off those bad-boys and nailed them in. 2.5″ framing nails did the job there. Oh, and the metal 2×4 braces make it super-easy to support the 2×4 beams on the fence posts. The post-hole digging was fairly easy, going down into soil and a bit of clay. Only 1 of the 9 holes presented a real back-breaker of a problem, where I crashed right into some major tree roots. What to do ? Do you move the hole, and get flexible with the sizing of the rest of the sections, or do you wiggle around in the ground a little bit to squeeze the post in where you wanted it ? In this case, I had to make a tough-decsion, and I didn’t do the tree a favour – I hacked through part of the root so I could get the post in the “right place”. argh. Had to get a little creative in the last mile here, as the fence-line basically collides with a tree on the property line. 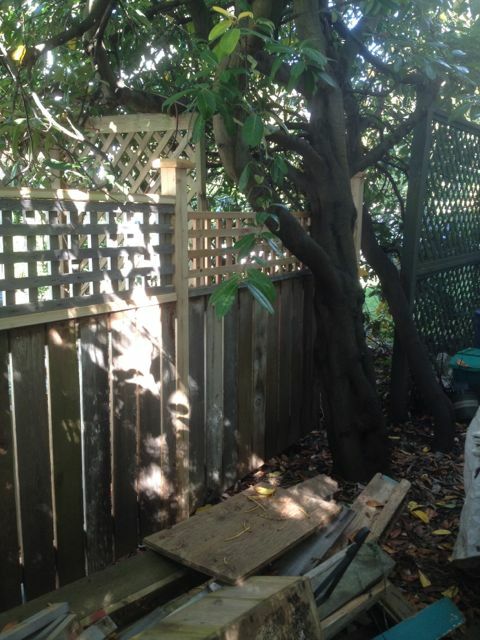 So, I stayed true to the fence-line, in the interests of keeping it straight, and ducked the lattice panel underneath one of the tree limbs. 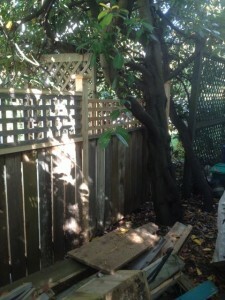 I also had a cedar plank with a chunk muscled out of it that would fit nicely around one of the lower limbs that stretches out into the neighbour’s yard. I was topping the lattice panel sections with a 2×4 cedar beam, but couldn’t quite squeeze a 2×4 into this section, so used a 2×2 cedar length instead. Many trips to Castle Lumber over on Cook St. for the supplies on this project. Seasonally speaking, this is the time of year for enjoying panettone. You might be able to find a few panettone left at your local bakery, or grocery outlet – indeed I saw a few left at the store yesterday. They hadn’t been picked up before the holiday, so were sitting there, waiting for purchase, or a trip to the mark-down table. Prices vary on store-bought, from under $10, to over $20 – so your mileage will vary there. Panettone can also be made in your home-kitchen, and in this blog post, I’ll show you how you can make a fine panettone at home. 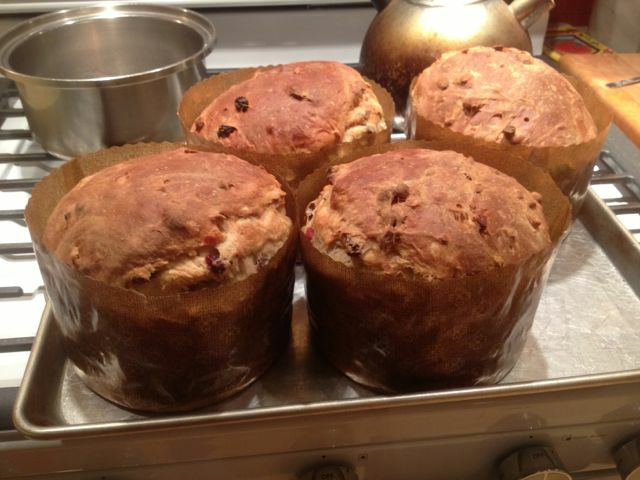 This year, I made 4 panettone in the home-kitchen on Dec 20-21 – 3 went out as gifts, and 1 stayed home for us to enjoy on Christmas morning. I selected the recipe from Peter Reinhart’s book The Bread Baker’s Apprentice for this round. The formula results in 2 panettone loaves, and I usually like to do 2 batches at once to yield the 4-pack. The activity is spread out over 2 days, so does take some time, and a bit of organization in the home-bakery. This recipe also calls for a wild-yeast sourdough starter, which I do have handy in the fridge. There are other recipes out there that don’t call for a barm on standby, so look around if you don’t happen to keep a sourdough starter alive in your kitchen. I keep 2 bowls of wild-yeast starter going at all times here, 1 of them since 2009, so if you need some let me know. 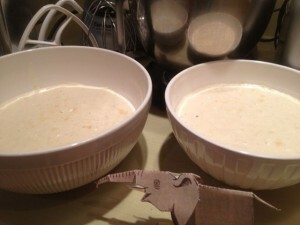 Pictured here are the 2 batches of wild-yeast starter mixed with milk and some flour. The sponges get assembled the day before the dough is mixed, so here they are. I mixed these up in the evening, and let them sit out overnight. 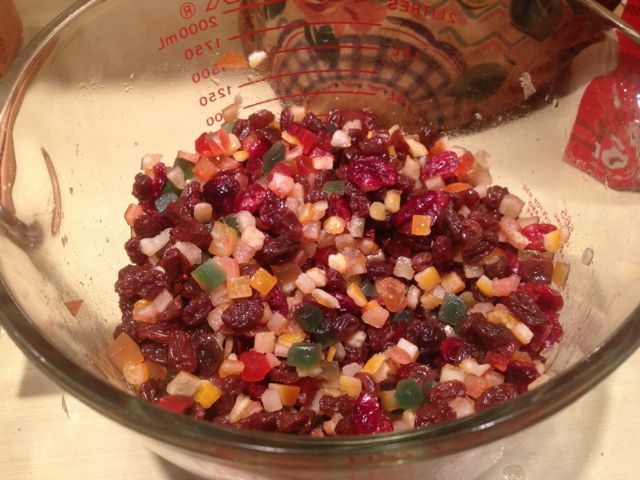 So, with sponge bubbling and fruit spiking, then go to bed, and return to the kitchen the next morning. Make sure you’ve got all your ingredients ready the next morning, as you’ll need to plan for the various stages in the dough-making phase. This year, I got into the kitchen a little late, around 11:30 AM, but still had enough time in the day to complete. 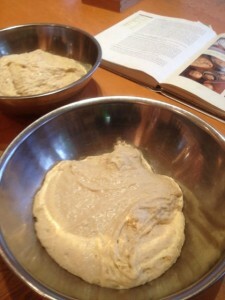 You’re going to start with making 2 batches of dough, shown here. 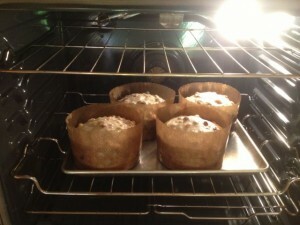 You’ll need flour, sugar, salt, commercial yeast, the sponge, 1 egg, and an egg yolk. This dough will need some time to develop the gluten, so that’s what is happening here. I used 2 varieties of organic flour on-hand in the kitchen pantry for this dough, an organic unbleached white flour (14% protein) and a red-fife sifted wheat. The formula calls for the wild-yeast to be spiked with commercial yeast, and I stuck with that plan – although didn’t actually proof the commercial yeast, so not sure if it had legs before I used it. Once the dough has had a little time to proof (at least 20 mins), time arrives to mix in the spiked fruit, and some butter. The whisky did the job on this batch, creating quite a nice batch of fragrant, soaked fruit. Mmmmmm! This dough can be mixed by hand, or in a mixer. I’ve got the KitchenAid stand mixer here, so that really helps accelerate the bread-making process around here. However, this dough hits the capacity of the mixer, and needs to be carefully tended while making rounds in the bowl. This year I didn’t lose too much of it as it crawls up past the top of the dough hook into the axle housing of the mixer. So, here is the mixed dough, on the right, after a round in the mixer, and then some kneading by hand. It’s helpful to do a bit of kneading by hand so you can get the feel for how far along the dough has progressed, and transitioned out of sticky, and into tacky. On the left here, you can see that there is a bowl of almonds soaking in the background. I picked up organic whole almonds for this batch, and needed to blanch them before slicing them up and mixing them into the dough. 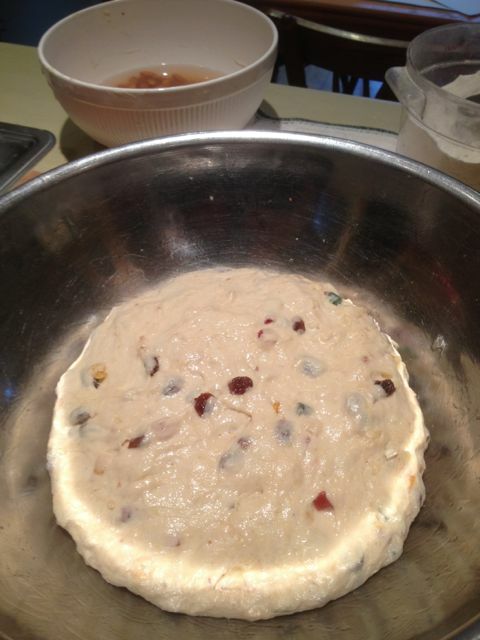 Once the almonds got mixed in, then the dough needs to sit out and rise at room temperature for a couple of hours, to increase in volume by approx. 1.5 times. During this time, go for a coffee, or run an errand or something. 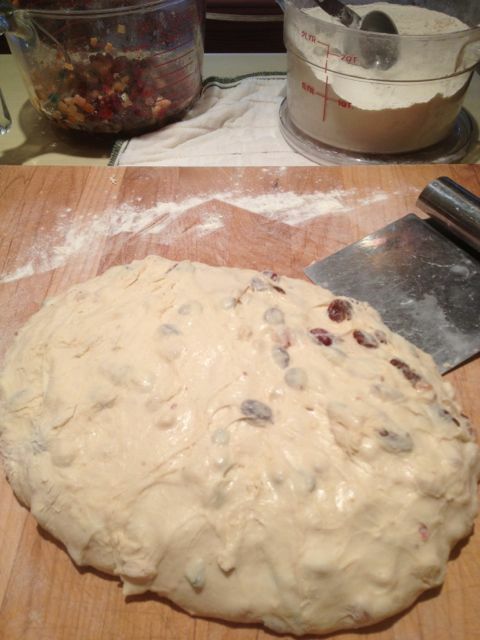 If needed, make sure pets will not devour the dough, and remind young children not to squish or slap the dough around, as it needs to rise undisturbed. 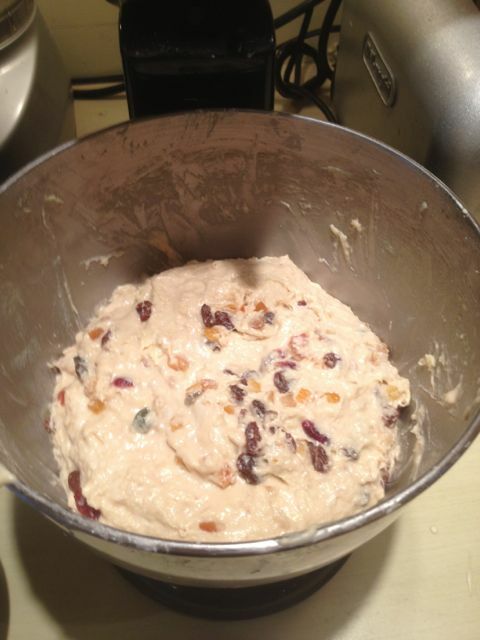 This year, I went downtown to tackle some last-minute shopping while the dough was rising. 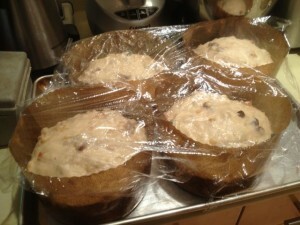 Once the dough has risen, it’s time to divide, shape, and set up in the large size paper panettone baking sleeves. This year, I had 10 sleeves on hand which is great, so no panic there. I divided the dough by eye-balling it, then fine-tuned with a kitchen-scale to get an even distribution for the 4 loaves. Shape by rounding into boules, and then put into the prepared baking papers. Cover, and leave out to rise at room temperature for another 2 hours. The photo shows that these loaves have risen nearly to the top edge of the baking papers, and at this point I put them into the oven – at 325 degrees, for up to 90 minutes. While I was out today, I called around to my usual suppliers in order to buy some more large-size panettone baking sleeves, but all advised that they were low on stock in the large size, and to try again next year. Bond Bond’s had some small-size panettone papers, so I bought some of those – thanks! I usually re-stock at this time of year while the local bakeries have their supplies at hand. Yes, I see that I was blogging in the summer, while on the road. And now here we are in Winter. Could be that I’ve become a seasonal blogger ? Yah, that’s it! Let’s break all those rules about blogging regularly, and blog at only select special times of the year! Happy New Year!